I dropped by to visit sifu Marcos Sanz at his kwoon located inside his home. It was a hot and humid afternoon. More humid and foggy here, since his home is near the coast. Fortunately, this was my last interview on this trip to discover Wing Chun in Peru. 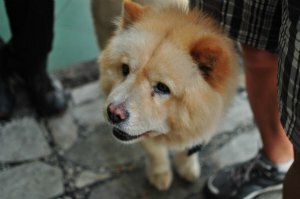 We were greeted by his dog, a Chow Chow and his other dog, which he and his wife found as a sick stray and nursed back to health. Sifu is originally from Spain. He moved to Argentina in 1998, and later came to Peru in 2006. While he was in Argentina he discovered Wing Chun and studied under sifu Leonardo Crivellari. Sifu Marcos Sanz’s lineage looks like this: Ip Man - Moy Yat - sifu Imamura - sifu Leonardo Crivellari - sifu Marcos Sanz. His kwoon is set up in what should be the living room of his home, which is very similar to a split level townhome. On most nights, classes are taught in tight quarters, so “everyone really gets to practice close quarters combat,” sifu says. 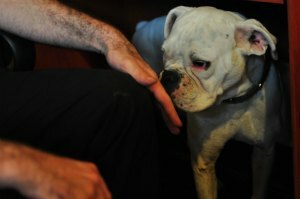 Meeting his dog should have given me a clue about sifu Maros Sanz. Sifu considers himself a pacifist. He is also a vegan and doesn’t eat any meat or animal products. He has a vast knowledge of the healing powers of optimal nutrition and exercise. During our interview simu (sifu’s wife) offered me a glass of homemade ice-cold almond milk, mixed with sesame seeds, and a few other wholesome ingredients. It was tasty and great! His students are fortunate to benefit from sifu’s exercise and nutrition recommendations, along with Wing Chun training. He didn't come the Peru to teach Wing Chun. He came for work and personal reasons. For about one year, he taught a few friends informally and without pay. “Because it was informal and I didn’t charge anyone any money, no one took it seriously and no one showed up for class,” sifu said. About three years ago an opportunity came up where a student offered to pay him for classes. For about a year that was his only “serious” student and they trained after work. But quickly thereafter, he found others willing to take Wing Chun lessons, so sifu Marcos set up a kwoon inside his home. “I found out that people take Wing Chun seriously when they pay for classes,” he said. Study For Six Months And Open Your Own Wing Chun School, Guaranteed! Very early in his formal teaching days, he had one enterprising student train with him for six months, then behind sifu’s back went out and opened his own Wing Chun school. The problem was this student advertised that he had over 20 years of experience! Sifu Marcos Sanz quickly got phone calls about this “new” Wing Chun sifu. This guy was an impostor and a liar. And sifu put his foot down, exposed the fraud for what he was, took steps to publicly denounce him, and make sure the hack didn’t smear his own reputation. It was a scandal. But as a result of this trial by fire early in his Wing Chun teaching career, sifu Marcos Sanz gained many new and dedicated students. Sifu’s teaching style is influenced by the Moy Yat way. Which is , he teaches without belts, without grades, and no uniform required. Students are free. They come to class in their own gym clothes, street clothes, and sometimes right after work dressed in what they wore that day. He encourages his students to train and practice outside of class. And especially to do their stretching, warm ups, or any other workout before getting to class. This way, when students arrive to the kwoon, it’s all Wing Chun. His students range in age from 10 years old to 76 years old. Everyone trains together at the same time. The biggest challenge he faces is that students are usually too rigid. Even students with past martial arts experience are too stiff. They don’t have enough sensibility or feeling. “They don’t know how to relax. Too much thinking,” he says.